Hello and Happy Tuesday! I'm happy to be back posting with the other Twinsie's after skipping last week. I do apologize about that, but time really got away from me! Kind of like how today is the last day of September....where did this month go!? Just crazy....crazy, crazy, crazy! Oh well, that means it's time for me to start planning some Halloween posts and a Halloween Nail Art Wheel!! Let's not rush into that though, time to talk about this post right here, right now. Today we are posting all about our "Biggest Splurge." I really wasn't sure what to do. If I had to pick a week to skip, I would have picked this one because honestly I do not splurge on nail polish. I refuse to spend more than $5 on a bottle. Maybe I would spend $6 or $8, but it would have to be a really awesome one. The polishes I have numerous back ups of at the moment are China Glaze Capacity to See Beyond, OPI Eurso Euro, and OPI My Boyfriend Scales Walls. Let's take a look at the mani I came up with using all three! When The Giver Collection first was released by China Glaze, I really wasn't feeling it, until I saw swatches of Capacity to See Beyond. It is the perfect blue polish that I have searched for since I started my little nail polish hobby. After snatching up one bottle, I realized it wasn't going to be enough and I went back to every Sally's until I had more! The polish applies perfectly in two coats and is so bright and shiny. It's perfect. OPI Eurso Euro is a gorgeous polish which I purchased originally because it looked pretty in the bottle and at the time I needed a dark blue. It was on sale and I thought why not. Notice, the polish was on sale...I refuse to purchase OPI at the $9 retail price. It's the perfect dark blue which I think everyone needs to grab a bottle of. Applies perfectly in two coats, and looks amazing with a top coat of INM Northern Lights. I went for a complete cream look here, so I stayed away from my glitters. OPI My Boyfriend Scales Walls was a polish I never saw myself purchasing. When the Spiderman collection came out, I saw it and thought "Why would anyone spend $9 on a white polish?!" After hearing many bloggers rave over it, and many of my nail girls told me I needed it, I caved and purchased a bottle on sale. I kicked myself that I didn't get it sooner! It's the perfect off white base for nail art...not too bright, and not too dark. To date, I think I've purchased 5 bottles, mostly on sale. Most recently I found two bottles at Beauty Plus Salon on clearance for $3.95 each. How could you pass it up?! I may go back and snag the other two I saw there the other day! I attempted to do a plaid design on my accent nail, and really hated it, so it was removed almost immediately. 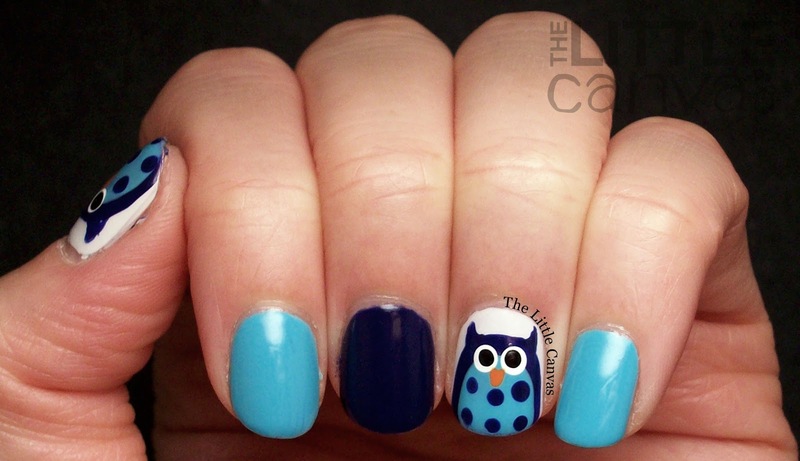 I was looking through my Pinterest boards for inspiration, and came across my owl manicure from last year. 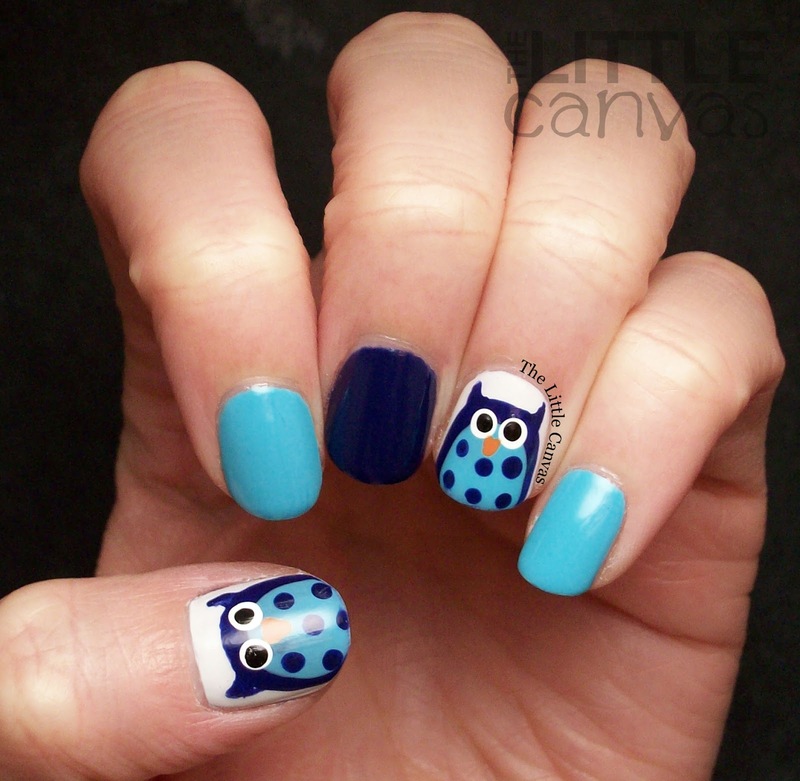 I always do owls in the Fall and thought a little blue one would look adorable! I did him a little differently than I normally do. I used my polish brush to create the body, then drew on the ears with a nail art brush. 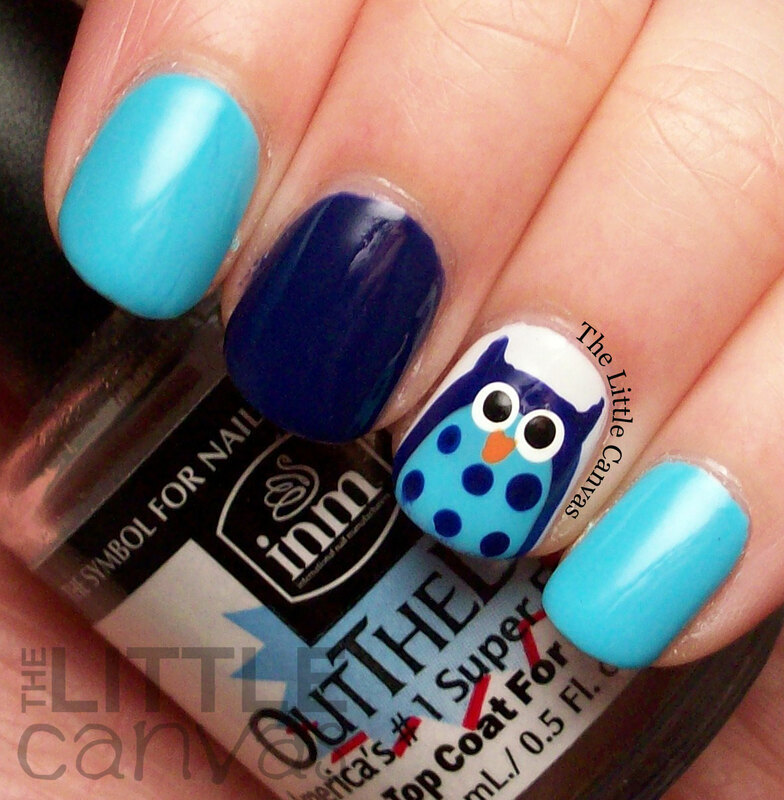 I like him better than the whole nail owl look. 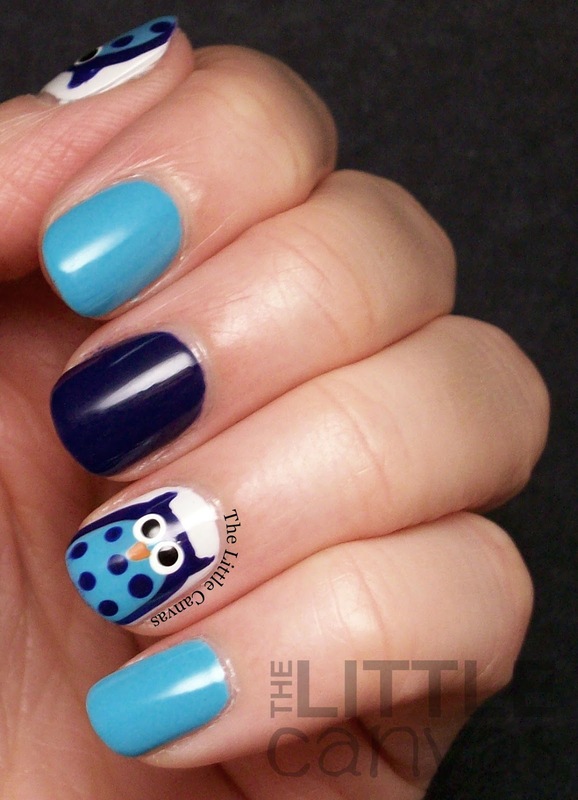 I'm happy I went with an owl accent...he's so stinkin cute in blue! What do you think? Liking this look? Is it passable for a splurge post? Is there a polish you cannot get enough of and would buy numerous back up bottles? Goodness, I wrote a lot! I guess I'm very passionate about my favorite polishes!